in what ways has God invested in us? how do we put that investment to work in such a way as to earn a return for him on his investment? There are, essentially, five types of capital – spiritual, relational, physical, intellectual, and financial - and if we want to grow any one of them, we do so by investing the others. Finally, it will involve financial capital. Having been lent a bike, my initial financial investment is a helmet, but, if I get on with riding then a point will come where I need to buy my own bike. The question is: if I want to see a return on the spiritual capital I invest for God’s glory in this part of Liverpool, am I prepared to employ the other forms of capital at my disposal to see it happen? Finally, it also requires of us a financial investment. The combined cost of petrol for the journey and a babysitter mean it is not a cheap night out...but, again, we choose to prioritise it because of the return we have seen over the years, in both relational and spiritual capital. There are, essentially, five types of capital; and if we want to grow any one of them, we do so by investing the others. Jesus spoke of storing up treasures in heaven, and of faith that is intended to grow as it is applied. The Bible is full of examples of spiritual gifts God invests in his children, to be exercised to his glory. Jesus invested in relationships: with the 12; with Peter, James and John; with Mary, Martha and Lazarus. He knew that he could not complete the mission he had been sent to fulfil on his own. Note: the rise of social networking – seen by some as enhancing, by others as detrimental to, relational capital – raises both opportunity for and threat to this form of capital. God has given us a physical body, to be responsible for. As a general rule, our physical capital decreases with old age, but we can invest in the physical capital God has given us. Rising obesity, rising early liver damage as a result of binge drinking, and an epidemic of Chlamydia all indicate that we have a generation of young adults in our society that do not know how to invest wisely in the physical capital God has given them. God has given us a mind, and commanded us to love him with all our mind (as well as all our heart, all our soul, and all our strength). This does not mean that we are all academically gifted; but we have the capacity to grow in our understanding of the things of God. The psalmist writes of meditating on God’s word day and night; while the books of Proverbs and Ecclesiastes are full of enquiry into the workings of the world, human and animal, in order to learn from God. Note: in our age of information technology economy, intellectual capital has become increasingly important. But note also the difference between in/access to information, and the ability to interpret information wisely. This is the one that most people appear to consider most important. Straw polls indicate that the number one ambition of young adults today is to be rich, closely followed by to be a celebrity. This is aggravated by the hope of instant riches held out by the Lottery, and a media obsession with people who are famous not for any talent or achievement but simply famous for being famous...But financial capital, according to Jesus, is not there to be reinvested in its own sake. Jesus used parables to illustrate certain truths about ‘the kingdom of heaven’ – that is, the sphere of God’s power and authority in the world, which, as it is extended, brings light to those living in darkness, freedom to those held captive by the oppression of sin and tyranny of death. We tend to be most familiar with those parables that drew on agricultural images – the sowing of crops, the shepherding of sheep – which is perhaps ironic given that most of us live in urban contexts to which such images are alien. But Jesus used other images, too, including the world of business, of commerce, of financial investment: urban images. The parable of the bags of gold (Matthew 25:14-30) reveals to us that God has invested in us, and expects a return on his investment (a return which he then re-invests in us, for even greater return). The parable of the shrewd manager reveals to us that we can use one form of investment that we have, in order to grow another form of investment that we don’t have but do need. The particular illustration is of using intellectual capital (shrewdness) and financial capital (money owed to his master) to grow relational capital (turning his masters debtors into his friends) that will lead to physical capital (provision, without recourse to manual labour or begging). Jesus’ view of financial capital in particular is that it always exists not for its own sake, but to be invested in other forms of capital - with the ultimate goal of all other forms of capital being to be invested in spiritual capital, that which lasts for eternity. Back in 2005, God called us on a journey out from Sheffield, out from all we’d learned from him there over the previous almost fifteen years; a journey that has brought us, eventually and by a circuitous route, to Liverpool. The first stop on the journey was Perth, Western Australia, and the journey has been framed by two England Ashes victories: we arrived in Australia on the day England won the Ashes in 2005, and our arrival in Liverpool has coincided with winning them again in 2009. At the weekend, we took a trip to Crosby Beach, next to the Liverpool Docks – a backdrop that reminded us of the docks at Fremantle. 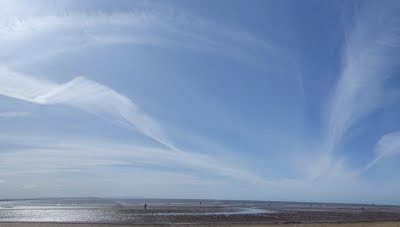 The beach is also home to 100 iron body-casts of the sculptor Antony Gormley. Scattered across the sand (three kilometres along the beach, and up to almost a kilometre out into the sea), they stand looking out to the horizon, as the tides flow in and out, and the sun sets and rises over them. The installation is titled ‘Another Place.’ It explores the relationship between us and the environment: the way time and the elements shape us (erode us); the paradoxical way we both dig into place, and are drawn from it, longing for what we do not know. That is a profoundly biblical experience: life as paradox held in tension; an existence that is both tied to the ground we are formed from, and inspired to journey beyond what we know. 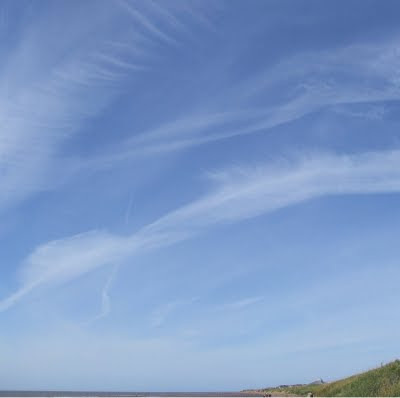 Gormley himself suggests that the overwhelming expanse of the sky calls into question the solidity of the earth: but biblical faith does not consider heaven to be more real than earth; rather it looks to the making-new of both. At another point in the journey, I had to travel to London, where I took the opportunity to visit two other Gormley installations: ‘Event Horizon,’ which was another series of his body-casts, this time spread across the London skyline; and ‘Blind Light,’ an enclosed glass room filled with fog, in which visitors could walk, tentatively, disoriented, around – a perfect illustration of walking by faith and not by sight.